Sharpen Your Pickaxes! Trim Your Beards! Deep Rock Galactic Is Coming To Steam Early Access And Xbox Game Preview On February 28! SKÖVDE, Sweden – Feb. 14, 2018 – Deep Rock Galactic enforcers Coffee Stain Publishing and Ghost Ship Games are calling on all dwarves across the globe to join the Deep Rock initiative in its widest recruitment drive yet! Starting on February 28, 2018, any hardy dwarf with a taste for adventure and a proficiency in firearms can join their most ambitious mining operation to date when Deep Rock Galactic lands on Steam Early Access and Xbox Game Preview. Enlisted dwarves will be paired with up to three like-minded brethren and sent on missions to the most hostile planet ever discovered, Hoxxes IV, to mine precious gems and metals. 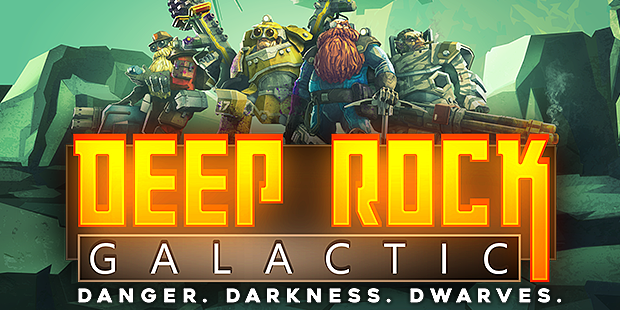 Cooperation is essential to your success and, as an interplanetary mining conglomerate, Deep Rock Galactic depends on its employees to take care of each other. Players take up arms as one of four classes of badass dwarven miners, each with their own invaluable set of skills and gear. The Driller, the Engineer, the Scout and the Gunner must work together to survive a relentless onslaught of ravenous aliens and escape the procedurally generated caves with their bounty intact. “With Deep Rock Galactic, we wanted to create a true co-op experience where teamwork really matters. We’re mixing the traditional co-op shooter with all the goodness of huge procedural levels, lots of exploration and mining and all the personality of fantasy dwarves – but in a sci-fi setting,” says Mikkel Martin Pedersen, Game Director/Co-Founder of Ghost Ship Games. Deep Rock Galactic first began recruiting brave space mining dwarves when it enter Closed Alpha on Steam in December 2016. Since then, more than ten thousand test-subjects have played the ever-improving Closed-Alpha builds and delivered invaluable feedback to the team. By popular demand, the team have thus far added upgrades, drones, vanity items, a mini-boss, biomes and refrained from fixing the broken barrel physics! “Moving into Early Access and Game Preview, we’re really excited to keep developing the game with the help of our awesome community. At launch, 7 unique regions of Planet Hoxxes will be ready to explore, mine and get lost in, but really this is just the beginning and Hoxxes has only just begun giving up her secrets. We have SO many more ideas and can’t wait to start implementing them all,” said Søren Lundgaard, CEO/Co-Founder of Ghost Ship Games. To learn more about working for Deep Rock Galactic visit deeprockgalactic.com and follow them on Twitter and Facebook.